The relationship between obesity and poverty has become more obvious and complex: being poor in one of the poorest countries may be associated with poor nutrition, while being poor in a developed country could mean a higher risk of obesity. Obesity is a problem for all races and ethnic groups in the United States and, generally speaking, affects people of all income levels. But a higher proportion of the poor, minorities, and the less educated tend to be obese. The mission of medicine is to develop scientific and practical bases for disease prevention and to devise effective ways to educate the public about health risks. None of this is to deny that social conditions, especially poverty, affect physical well-being and length of life. 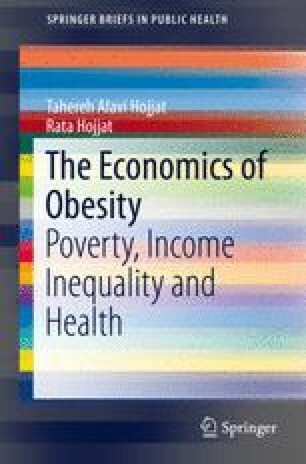 In this chapter, we will explain different types of poverty and will identify how socioeconomic groups with low personal capital, low health capital, and low social capital have higher obesity rates than socioeconomic groups with higher endowments of intangible capital. We will support the idea that although government programs help the poor, poverty remains high because the inequality of economic outcomes has increased sharply.